Welcome to another edition of the “5 Reasons” blog series. This will be a weekly blog series, with a fresh post every Monday. Last week’s topic was “Five Reasons to Hire a Marketer”. Successful email marketing is all about getting your email delivered. Or is it all about getting people to open? Or click? 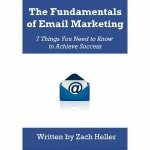 Okay so by now you should know there are a lot of elements of email marketing that need your attention. But one thing you really don’t want to see is a large number of people unsubscribing from your mailings. If you do, something is wrong. You didn’t get their permission. In this day and age, you should only be emailing opt-in subscribers. If you’re emailing people without their permission, you deserve what you get (likely your name on a blacklist). They forgot they gave you permission. This happens more often that you might think. People sign up from something they didn’t mean to, or they forgot about by the time you email them. That’s why I recommend sending something shortly after people sign up just to help set their expectations. You didn’t deliver what they expected. Be clear about what you will be sending people, and then stick with that promise. Don’t offer a monthly newsletter and then start emailing daily deals after they sign up. You email them too often. The emails I get from the Democrats will always be the campaign I point to when I tell people how NOT to run an email campaign. If you email someone too often, even if it’s something they’re interested in, you risk driving them crazy and losing them from your list. Again, it’s best to set expectations early about the frequency of your emails and don’t stray too far from that plan. Something has changed. I know, real specific right? But this is the kind of reason that is not necessarily anything you need to worry about. Maybe they purchased from a competitor and they’re not interested anymore. Maybe they moved and don’t need your local deals anymore. Something about what you’re offering no longer applies to them. So losing them from your list is not as bad as you might think.